Here I provide best 12 educational apps for SSC exam preparation. Using these educational apps you can easily preparation of ssc je exam and other ssc exam. This educational app is best for preparation of all India general knowledge quiz. Using this education app you can easily preparation at your home, collages, office etc. SSC GK app is #1best educational app for preparation of India general knowledge. 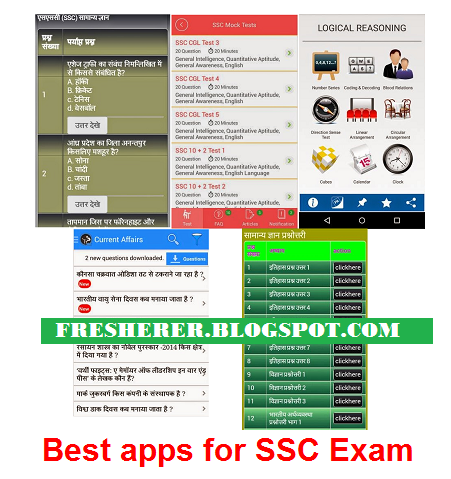 SSC Gk Guide in Hindi is Best Educational apps for SSC Exam preparation. Pocket Logical Reasoning app is best for practice aptitude & reasoning example such as Number Series, Blood Relation, Letter Series, and CubesPocket Logical Reasoning app has also defined solution short trick methods so you save time in competitive exam. This app is Educational apps for SSC Exam preparation. Online General Knowledge app is best for preparation for SSC, UPSC. On my experience with this app is #1 best for updated Current Affair. It will regularly update the current affair in your mobile if you have online. Online GK app includes General Study, Aptitude and Exam Specific such as SSC Exam, Railway Exam, UPSC etc. This is the Best Educational apps for SSC Exam. SSC CGL & 10 + 2 educational app is best for preparation of general knowledge, quantitative aptitude and English language. SSC CGL & 10 + 2 is Best Educational app for SSC Exam. This android educational app contains topics of GK, latest current affairs 2016, NCERT questions & solution, Mathematics, English language and computer knowledge. This logical reasoning app contains topics of Analogy test, Blood relations, calendars, coding & decoding, letter series, linear arrangement, number series and more. This SSC & Bank exam preparation app for android device contains topics of General Knowledge, Verbal ability & reasoning and Arithmetic aptitude. Also includes 50000+ MCQs type questions and daily quiz for practice. This best educational apps for all competitive exams also includes Hindi dictionary and available in both Hindi & English language. I hope all apps help you prepare ssc jen exam.